Finding your next new car starts with a visit to your Woodstock Kia dealership. That's because there are so many choices in one place at Carriage Kia. Families, commuters, professionals, and students will find a good match in this big lineup. Rio, Forte, and Optima come in multiple styles. SUVs range from the clever and compact Soul to the highly ranked three-row seating Kia Sorento. There is little to compare with buying a new car or SUV. A feeling of confidence comes as you drive off the lot. With Kia, you know your new vehicle will last for years to come. Demonstrated durability and good resale values suggest the strength of your Kia investment. Long warranties back up the promise of quality. New turbo technologies offer a blend of performance and fuel economy. Owners enjoy savings at the pump that acts as a return on the initial purchase price. Families will appreciate the spaciousness and versatility that are essential ingredients in KIA cars and SUVs. Kia's aerodynamic styles and handsome sheet metal create enviable curb appeal. Fun behind the wheel is a major dividend, too. The latest technologies are ready to entertain you. UVO touchscreens now come with Apple CarPlay and Android Auto. These coveted integration systems multiply what your entertainment system can do. You can stream your map programs to the dash, allowing you access to turn-by-turn directions even if you don't get the navigation system. Advanced crash avoidance systems are ready to complement KIAs excellent safety record. You can enjoy the help of a pedestrian watch, forward collision warning and an autobrake. A blind spot monitor and a lane watch help drivers avoid common collision situations. The rearview camera can be upgraded to a surround view system, perfect for three-row rides like the Kia Sedona or Sorento. Warranty coverage offers peace of mind, especially when those warranties are from Kia. Leading the industry, Kia has a 10-year or 100,000-mile powertrain warranty and a five-year or 60,000-mile basic warranty. There is also a five-year or 100,000-mile anti-perforation warranty. Last but not least, the roadside assistance is available for five years or 60,000 miles. All of these guarantees demonstrate that Kia is ready to stand behind your purchase. 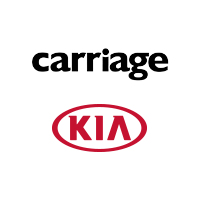 To explore current offers and financing specials on your next new automobile, visit Carriage Kia of Woodstock. We have an extensive inventory of new Kia models to choose from. Our knowledgeable team will help you select the right vehicle for your needs. Packed with the latest new vehicle technologies and features, every new Kia is a thrill to own and drive for years to come. Contact our new Kia car dealership in Woodstock, Georgia to schedule a test drive. We are a just short drive north of Atlanta and are family owned and operated.